I’ll admit, this is a Cheat Day breakfast, but, boy, if you’re going to go for it, this is the dish you want. I do have bad news; the B&G you know and love is, wrong. 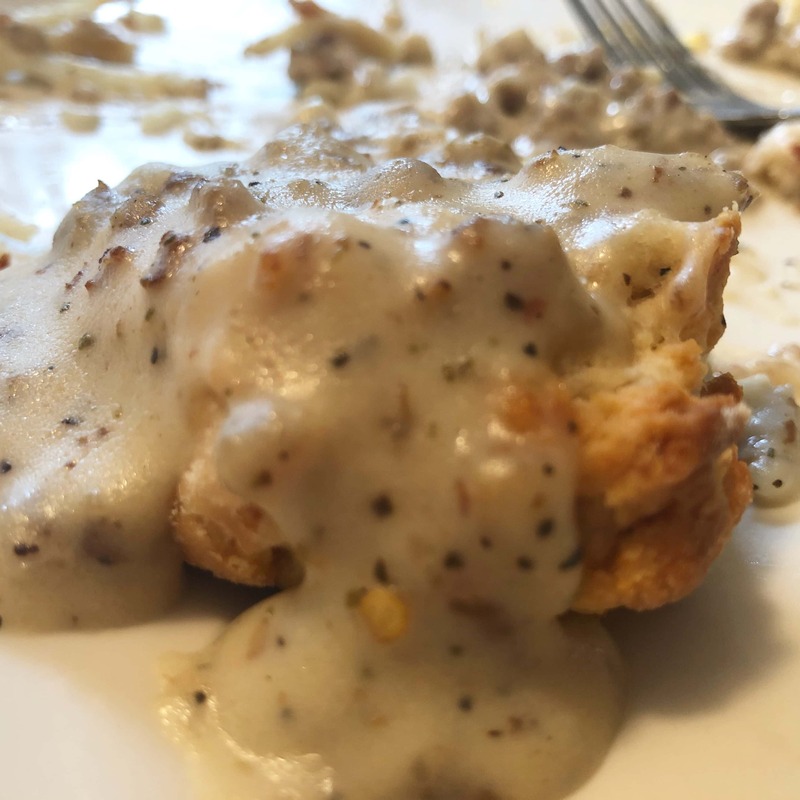 B&G typically is a sawmill (milk based) sausage gravy over southern style biscuits. The gravy I have no quarrel with, but rather those fluffy, southern biscuits. A true southern style biscuit is flaky, tender, and soft… which means after 5 minutes, they turn into a pasty mush. Those biscuits are too delicate for heavy milk based gravy. What is needed is a biscuit that is still buttery, but has enough texture and density to hold up to all that wonderful gravy; drop biscuits. This recipe is straight from the original version of the Joy of Cooking, and it needs no modernization. Combine flour, salt, and baking powder in a bowl and mix well. Cut butter into pieces and add to flour mixture. Using a pastry cutter, a fork or your hands cut the butter into the flour to form a coarse meal. Add milk and stir until dough forms. Drop from a spoon (or your hands) onto an ungreased baking sheet (you’ll get about 8). Bake for about 12-15 minutes or until lightly golden. Heat dutch oven or large saucepan over medium high heat; add butter to melt. Cook sausage, 7-8 minutes or until brown. Dust on flour, stir to combine. Cook out flour for 1-2 minutes. Whisk in milk, being sure to scrape pan for any sausage bits. *90% of the flavor from this gravy comes from the sausage; buy the good stuff here. **I like my gravy thick, so I’ll likely add in a tablespoon of cornstarch loosened with some milk.